Alex gave us a tour of the farm. He showed us how they use grey water from the hand-washing bowls and kitchen dishes to water the banana plantations. The banana tree by the café was brown & poorly: “This one doesn’t seem to like the soap,” he says. But the others further down the hill were thriving in what looked like a very dry environment. 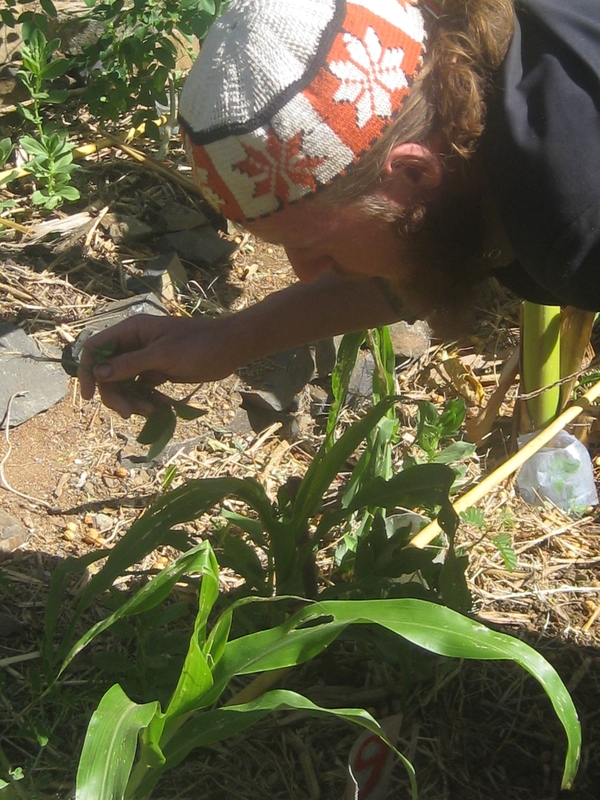 Permaculture is about creating an integrated life support system which balances the needs of humans and the environment. A whole and permanent farm or garden which mimics natural ecosystems to support human needs like food, clean water, air, energy, fibres for clothing and medicine – in the most productive and sustainable way possible. Unlike large-scale modern agriculture, which will generally clear entire forests (and eco-systems) to sow acres of monoculture crops; different plants, vegetables, herbs and cotton are planted together here. The diversity attracts birds and insects, which in turn, help to control outbreaks of pests or plant diseases, and make the use of chemical insecticides obsolete. In the nursery, Alex showed us a bed of young avocado, papaya and moringa, a popular medicinal plant, thriving together. Next to this, was a bed of moringa on its own – the seedlings were weeping and the leaves were riddled with yellow bite holes. 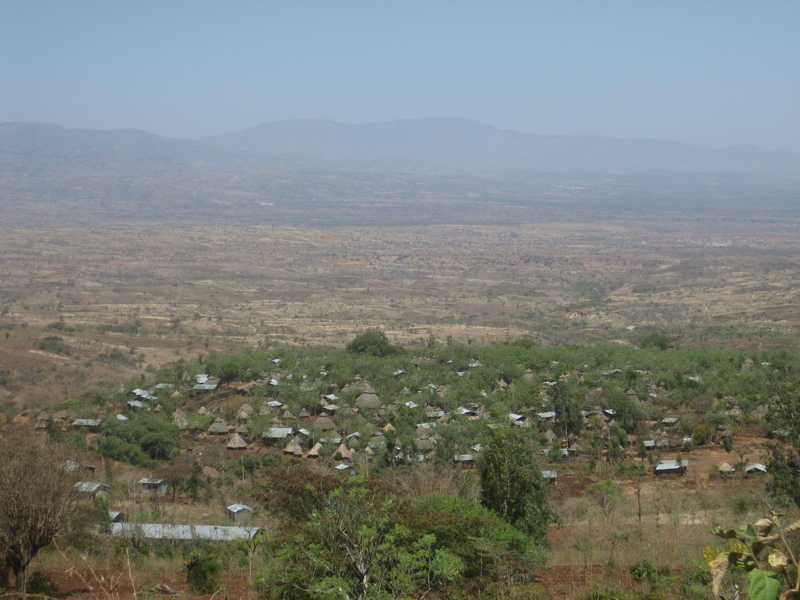 Konso’s economy is agricultural, with the majority of the population working corn (maize) and various sorghum staples, or growing cotton and coffee as cash crops. But the soil here is pretty poor, says Alex. So poor, in fact, that when he brought the over-grazed and eroded land for the lodge, it had been written off by the locals as ‘Lokollota’ or ‘dead soil’. They planted trees like Acacia and Leucinia, and began mulching the chalky, cracking clay with manure and organic waste. This encouraged worms to break it up and build nutrients. In doing so, they’ve created an oasis in a semi-desert. Around the chicken pens, they’re able to grow carrot, corn, amaranth, tomatoes, onions, ginger, garlic, swiss chard, corguettes, beans and peas, small mexican apples or Tazmir and moringa, wild cabbage, beetroots, avocadoes, sunflowers, mulberries, pomegranate and of course, strawberries. They grow small hot chiles and green chiles, coffee, sorghum, cassava and oil seeds like safflower. As herbs, they have lemongrass, mint, fennel, parsley, coriander and marigold. “We’re going to plant more fruit trees here when it rains, but at this stage we’re really just trying to build up the fertility of the soil,” says Alex. The Eco-Lodge is powered by the sun and the earth. At night, the garden is lit with solar lanterns and in winter, there’s the compost-heated shower to enjoy. 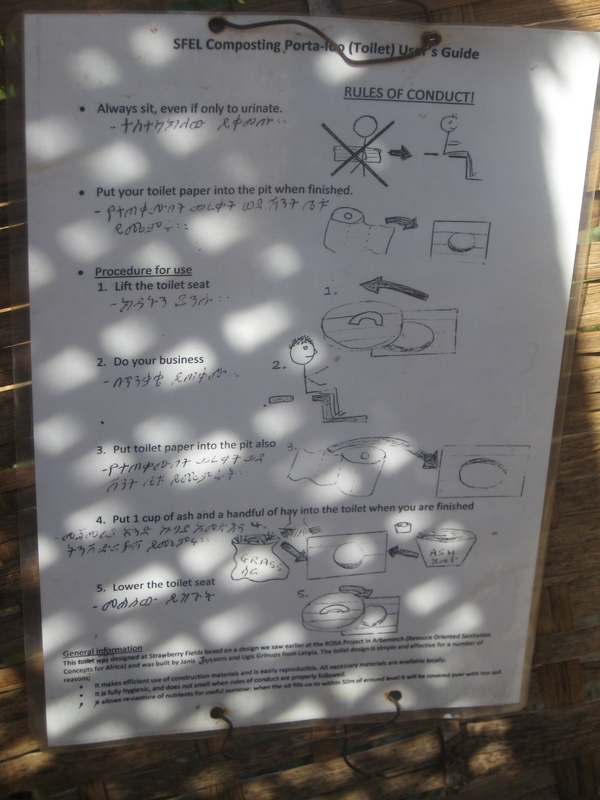 Good toilets in Ethiopia are hard to come by, and it was with great relief that we could relieve ourselves in comfort (and without holding our noses) in the thatched long-drop toilets by our Gojo Bets. The sign on the back of door instructs; “Do your business; when you’re done, throw in one cup of ash and one handful of straw. If all rules are adhered to, there will be no smell!” And it doesn’t lie. Can we use some of these principles in our own garden in Fiche? Fiche is higher and colder than Konso, but the soil problems are similar, and our goal is to create a healthy, sustainable garden without the use of harmful chemicals, or excessive water and expensive fuel. According to Alex, we should be able to grow avocados and apples for shade at that altitude. As a start, Lakew agrees we will have three compost pits and use animal waste for manure. But our favourite idea, by far, was the toilet! Great! 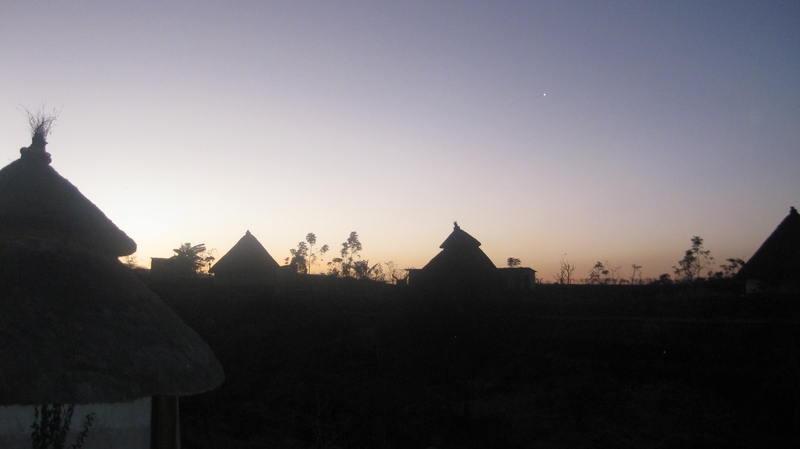 I was in Konso this year. what abut terraces you should be stetted!!!! loved the video – were all those people really running in time? Hi Rowie, thanks for your comment and advice. I gave the project co-ordinator some handouts on no-dig gardens some time ago – great idea, I will pursue it. There is no shortage of manure! Thanks for the encouragement.